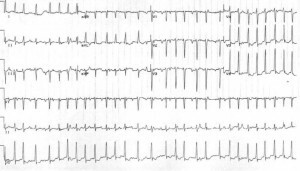 Case 2: A 21 year old G1P0 female at approximately 16 weeks gestational age presents with a chief complaint of syncope. She arrives to the ED with a complaint of lightheadedness but is alert and oriented and able to converse. She does complain of some mild chest pain. Her heart rate is 160 bpm and her blood pressure is 85/60 mmHg. Her other vital signs are within normal limits. Compared to the non-pregnant population, cardiac arrhythmias are rare in pregnancy, with an incidence of about 1.2 per 1000 pregnant women. However, they can negatively affect the health of both the mother and child, especially if they lead to hypoperfusion. Thus, emergently addressing them is important. Additionally, it is important to understand that the management of arrhythmias in pregnancy may vary considerably from the non-pregnant patient due to the potential effects of anti-arrhythmic medications and electrical therapy with sedation. Thus, this is a brief review of the evaluation and management of the pregnant patient who may present to the emergency department with a tachy-arrhythmia. Pathologic bradycardia is very rare in pregnancy and will not be covered in this current article. Arrhythmias in pregnancy can be due to a number of causes including congenital heart disease, channelopathies, and other structural heart diseases. Examples include Wolff Parkinson White Disease, pulmonary hypertension, Marfan syndrome with a dilated aortic root, arrhythmogenic right ventricular dysplasia, and even coronary artery disease. They can also be due to reasons that are commonly seen in non-pregnant patients such as idiopathic, infection/sepsis, electrolyte abnormalities, medications, toxins, pulmonary emboli and hyperthyroidism. Similar the general population, these causes should also be considered when evaluating for the underlying cause of the arrhythmia. For some pregnant patients, an arrhythmia may be recurrent from a previously diagnosed cardiac disease or a first-time presentation. Due to the many physiologic changes and stresses on the cardiovascular system, pregnancy can provoke arrhythmias in some women with undiagnosed structural heart disease (s). In addition, in women with known tachy-arrhythmias, pregnancy may cause an increased risk of recurrence or worsening of the dysrhythmia. A thorough family and personal history of structural heart disease should be obtained in addition to a family history of sudden or unexplained death. Palpitations are usually benign and life threatening arrhythmias are rare in pregnant patients, but evaluation for more serious arrhythmia is always necessary from an emergency medicine standpoint. As previously mentioned, assessing for underlying reversible causes such as infection, hyperthyroidism and toxins is important. However, if no underlying cause can be found and/or if the patient is unstable, then medical and/or electrical management is warranted. (a) Place the patient in the full left lateral decubitus position to relieve aortocaval compression. (b) Administer 100% oxygen by facemask to treat and prevent hypoxemia. (d) Evaluate for any underlying causes of the patient’s symptoms. However, just as in non-pregnant patients with an unstable tachycardia causing hemodynamic compromise, immediate direct current (DC) cardioversion is indicated. 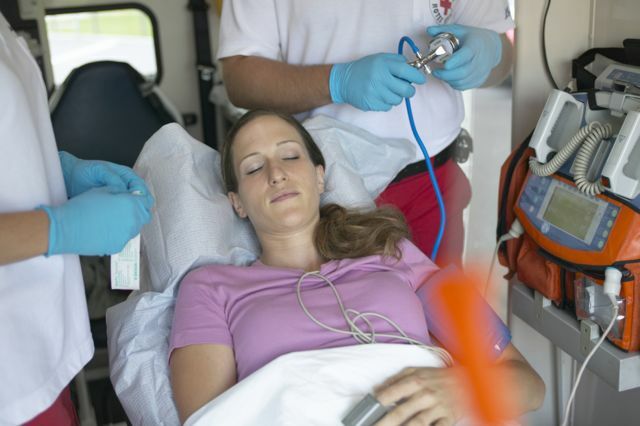 Overall, DC cardioversion has been found to be safe in all trimesters of pregnancy, but it does carry a small risk of inducing a fetal arrhythmia. Therefore, it is strongly recommended that when possible, cardioversion should be conducted with concurrent fetal monitoring and emergency caesarean section (C-section) availability. Women in later stages of pregnancy should have their pelvis tilted to the left to relieve compression of the vena cava, however the process, including the dosing of electricity, is otherwise the same as in non-pregnant patients. Higher doses of energy (up to 360J) in refractory cases still remains safe for both the mother and fetus. Neuman G, Koren G. MOTHERISK ROUNDS: Safety of Procedural Sedation in Pregnancy. J Obstet Gynaecol Can 2013; 35(2):168-73. Shergill AK, Ben-Menachem T, Chandrasekhara V, et al. Guidelines for endoscopy in pregnant and lactating women. Gastrointest Endosc. 2012; 76(1):18-24. The majority of arrhythmias during pregnancy are stable and can be managed with conservative therapies. Medication therapy should be considered in patients who are symptomatic and/or have tachyarrhythmias that may lead to negative hemodynamic or physiologic complications. Of course, any significant acute hemodynamic compromise should lead the provider to consider cardioversion, as mentioned in the above section. In addition, as previously discussed, a thorough history and physical should be conducted to rule out any reversible causes of the arrhythmia such as a pulmonary embolism, hyperthyroidism, hemorrhage, or infections. A history of prior episodes and/or a history of structural heart disease are also important to obtain. Once reversible causes are ruled out and a thorough history is obtained, a primary stable arrhythmia requiring drug therapy can be considered. The risk of any medication on the mother and fetus should be reviewed prior to its administration. Most antiarrhythmic medications have not been systematically studied in pregnancy and thus, all should be viewed as potentially harmful in pregnancy. Most of these drugs are labeled as a Food and Drug Administration (FDA) category C except for amiodarone and atenolol, which are labeled as category D. As a review, category C means that risk cannot be ruled out and any category C medication should be used only if the potential benefits outweigh any potential risks to the fetus. Category D means that there is evidence of risk. There may be a benefit of this drug but that patients should be informed of all risks of the drug prior to giving it. It should be noted that as of June 2015, the FDA initiated a change to pregnancy category labeling and that the use of letters will be phased out. In place of letters, a narrative summary based on the risk of each medication will be provided. Any medications submitted to the FDA after June 30, 2015 will use the new format immediately and that any prior prescription medications approved after June 2001 will have new labeling within 3-5 years. So as of now, most of these antiarrhythmic medications are still under the old letter category labeling but may change in the future. Teratogenic risk is also the highest in the first eight weeks after fertilization and thus, especially careful consideration should be given to women in early pregnancy who receive drug therapy (18). This is not to say there is no risk in the other stages of pregnancy, but the risk to the fetus is significantly reduced after the first eight weeks. Finally, it should be remembered that many of the physiologic changes of pregnancy will affect drug metabolism. Some of these changes include increased plasma volume, reduction in plasma proteins, changes in renal clearance of drugs and altered gastrointestinal absorption. Progesterone levels also increase, which can affect hepatic metabolism. Thus, administering the lowest effective dose of a medication is prudent in this patient population. While there are a few differences, the management of tachycardic arrhythmias in pregnancy is quite similar to the non-pregnant patient. DC cardioversion should always be conducted in patients with hemodynamic instability. Pharmacologic cardioversion of supraventricular and ventricular arrhythmias is possible in the stable patient. No drugs are completely safe in pregnancy, but most are rated category C in pregnancy and if the benefit exceeds the risk, then the medication may be given. Amiodarone and atenolol are two medications that should be avoided in the pregnant patient, especially in the first trimester. Rate control with beta blockers or calcium channel blockers is an option in patients with supraventricular tachycardias who are not immediate candidates for cardioversion. Stroke risk should still be accounted for and at risk patients should be anticoagulated with LMWH or vitamin K antagonists (only in the 2nd and 3rd trimesters and not in the last month of pregnancy). 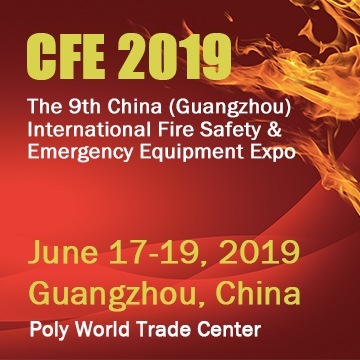 Finally, close cardiac monitoring of both the mother and fetus and availability of emergency C section should be available whenever medication or cardioversion is indicated. 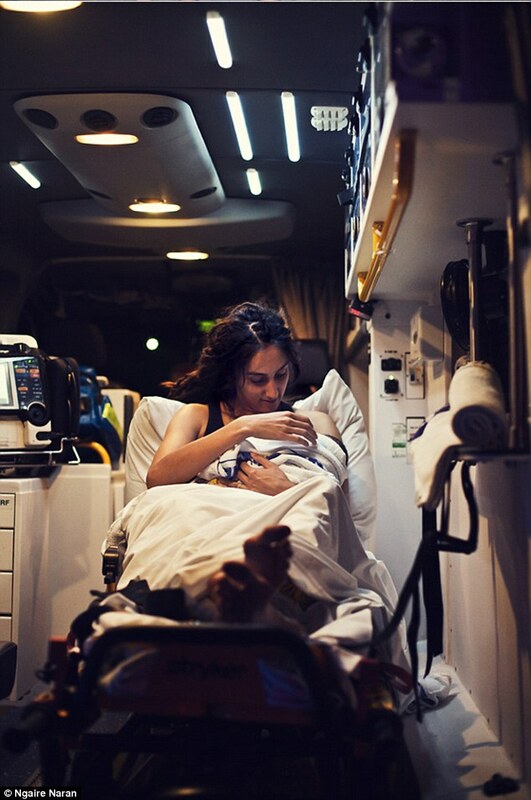 Finally, but importantly, obstetrics and cardiology consultation is prudent whenever a pregnant patient with an abnormal tachycardic arrhythmia presents to the ED. Case 1: The patient in this case has new onset AVNRT. Her electrolytes are normal, her thyroid function is normal, and her infection workup is negative. Since her vital signs are otherwise stable and she denies chest pain, adenosine 6mg IV push is administered. Her rhythm returns back to normal sinus rhythm and she is discharged home with close cardiology and obstetrics follow up. 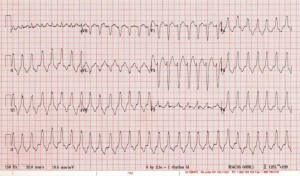 Case 2: This patient has unstable ventricular tachycardia. She is immediately cardioverted with direct current. She was ultimately found to have right ventricular (RV) outflow tract tachycardia. Obstetrics and cardiology were consulted and the patient was admitted for maternal and fetal cardiac monitoring. She was eventually discharged with a beta blocker for prophylaxis and cardiology follow up. 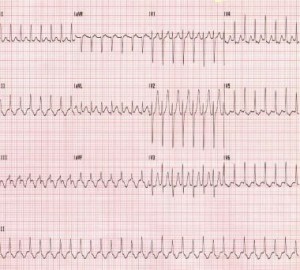 Case 3: The last patient has atrial fibrillation with rapid ventricular response. Her workup for infection is also negative and her thyroid function tests and electrolytes are normal. Since her symptoms had been present for several days, rate control was chosen. Metoprolol was given and she achieved adequate rate control. She was admitted for a transesophageal echo prior to cardioversion and eventually she was cardioverted back to normal sinus rhythm.